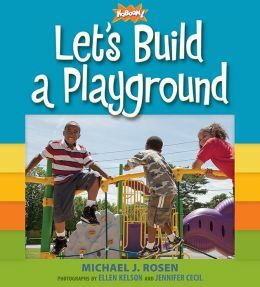 Building a playground KaBOOM!-style can also be a community-building event and this book proves it. From group-design to finished product, the process is revealed as it’s described from the perspective of a kindergartner. Details and measurements are transposed into a five-year-old’s body dimensions and the high-interest construction equipment and processes are explained in equally friendly terms. Whimsical free-verse is used throughout and showcases the creative thinking that planning a playground can inspire. The final assembly of this real-life one-day event includes 214 participants and ends with a custom play structure. Close-in, gorgeous color photographs, often full-page, catch all the action. Bright backgrounds add to the eye-appeal. This could inspire some creative play, but mostly it will be a great read aloud for kindergartner, first and second graders who may be planning their own playground. Slightly older children will enjoy learning about the construction process as well. 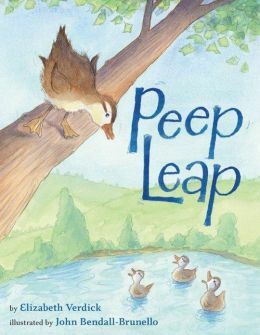 A delightful, adorable counting book for preschoolers, Peep Leap is the adventure of ten newly-hatched wood ducks taking the plunge from their nest in a tree to the ground far, far below. When all ten eggs have hatched, the Mama wood duck glides from the nest in the hollow of the tree to the ground below and begins to call for the baby ducks. One by one, the ducklings join her in the water below, until only one duckling is left in the nest. Afraid to take that first “step,” the duckling hesitates. Mama duck gently encourages the baby, until, hooray, number ten duckling finally leaps! And then the family of ducklings, Mama duck, and Daddy drake duck swim ‘round and ‘round in the pond. Peep Leap teaches the early math skill of counting from one to ten, counting backwards from ten to one, and numeral recognition. The illustrations are large and vibrant – just what a preschooler needs to enjoy the words of the story. Parents will enjoy reading this sing-song, rhyming picture book to an older toddler or preschooler again and again. The rhythm is soothing, and one can just picture a small child tucked in the lap of mom or dad, listening intently to the story just before bedtime. Adults will also enjoy the lessons of courage and bravery, as well as the positive outcome resulting from the parent’s gentle encouragement of the slightly-less-than-brave duckling. And, parents or preschool teachers will want to use this book as an introduction to nonfiction literature. An explanation of the nesting and fledging of wood ducks is included on the very last page of the book. Though this book would be best read aloud to a preschooler, late first grade students should be able to read the book with very little help and would most likely enjoy reading to a younger sibling or to a younger student in a peer-mentoring relationship. As follow-up, preschool activities, choose various items of different tactile materials in collections of ten to practice counting. You might also try this fun game: use yellow cotton balls if available and play the game on a tabletop. Tape a circular piece of blue paper on one end of the table with masking tape. Place more than ten cotton balls on the other end of the table. Have the preschooler blow gently on the cotton balls until only ten are in the “pond.” He or she will need to stop often to count the number of cotton balls on the blue paper pond. 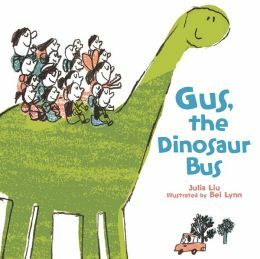 This is the tale of Gus, a dinosaur school bus. Kids think he’s awesome. They never want to get sick or sleep in for fear of missing a ride. He picks them up right at their door, and even apartment dwellers can hop out their windows and slide down his neck. He makes a good umbrella when it rains, and he never has to stop for gas. Gus is a perfect bus. Isn’t he? Not everyone thinks so. A supersaurus on the city streets has its challenges. Sometimes he gets tangled in the telephone lines, his tail has been known to hit a roof or two, and the city often has to fix his dino-sized potholes. Some people think Gus is causing more havoc than good. The school’s principal has no choice but to pull the dinosaur off the road. Banished to the school gym, Gus cries and cries. When the children come to visit him they find a literal swimming pool of tears. And in a classic case of turning lemons into lemonade, the children discover a new use for Gus: he’s the best dinosaur playground ever! Lui’s cute story brings to mind Syd Hoff’s classic Danny and the Dinosaur. The concept will definitely stimulate the imagination of many dinosaur-loving first graders. They will also latch on to Lynn’s pencil and watercolor illustrations, which have a child-like feel complete with scribbles and stick figures. Vocabulary and sentence structure are appropriate for beginning readers. This is also a good choice for a teacher read-aloud and/or classroom library.